With winter on its way a few routine steps will help keep you safe, comfortable and save you money. Check your smoke detectors. If you have an attached garage, live in multi-family, or have gas, oil or wood burning appliances, you must have a carbon monoxide detector!! All homes should have them, since there is no way to tell if you have a problem with CO. Most people never know they have a problem until someone is make sick or they are killed. Take any warning from a carbon monoxide detector very seriously, and call the fire department. If you have an oil furnace, have it checked annually. A very small adjustment can make a huge difference in your heating bill, not to mention reducing the pollution from poorly adjusted burners. Gas furnaces should be checked regularly too. Our recommendations is to have the 1st service at 5 years, again at 10, then every year thereafter for a mid efficiency furnace. (80% with metal exhaust flues) Some high efficiency models have shorter live spans (closer to 10 years) so they need annual checks by 7 years (90% plastic exhaust condensing furnaces) Be sure to keep up on changing your furnace filters. If you have a electric fan forced wall unit (like a Cadet or a King) be sure to properly clean them. We have a copy of the instructions here. Chimneys, If you heat with wood, have your flue swept and checked every year. Examine wood stoves for cracked or missing fire bricks, poor door seals, and loose or damaged flue pipes. 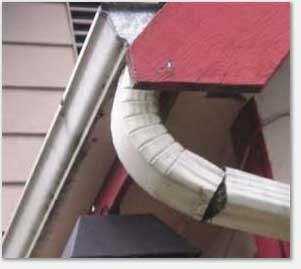 Clean gutters and check the downspouts assuring that they discharge away from the building, the further the better. All non frost free hose bibs should be insulated to protect them from freezing. Be sure to disconnect hoses! A hose will cause a frost free hose bib to freeze when the water in the hose freezes. Look at all trees, and other plants. They should be trimmed back so they cant touch the home. Any contact is a natural path for insects, rodents, and can contribute to structural pests. Walk around your home and look at the bottom row of siding. Ideally there should be 6 inches of concrete below the bottom row of siding. If soil or bark is piled too high there is a much greater chance of problems with termites ants or beetles damaging the home. Look at every window and door. Check weather stripping, repair as necessary. Look at every threshold and door sweep, if there are gaps, you will be loosing heat. Caulk all gaps in siding, trim, utility holes, etc. 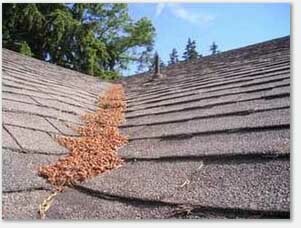 If it is safe to do so, remove any leaves and other debris from the roof. Use great care to not remove the granules on a asphalt roof. (DO NOT PRESSURE WASH) Ideally on a dry day, carefully use a leaf blower, debris in valleys and behind chimney's can cause water to back up and cause leaks.